The aim of the project is creating a new complex entity with the merge of Hotel Panoráma and Hotel Mirage, a hotel and medical system that operates uniformly, or can be divided into sections as well. It shall able to provide a full range range of customized, personal care to its guests. The buildings are located in the heart of Hévíz, on the busiest corner of the pedestrian percinct. One wing of the building (Hotel Panoráma) was built in 1930, the other (Hotel Mirage) in 1960. The two wings were merged during the reconstruction began in 2011. By the end of the process in 2012, a new floor was added in conjunction with a new roof. One big advantage of the project is that it is located next to the St. András Hostpital which has its own spa. There is a floor connecting them, so the guests can receive the hospital’s treatment as well, if they wish. The property lies ont he border of three cities (Hévíz, Alsópályok, Keszthely) with the area of 148,62 hectare total, the building development site is ~29 hectare out of which 9.5 hectare has 30%, the rest has 20% maximum parcel coverage. The project’s aim is to build a center which offers a wide range of activities and recreational possibilites. Constructing a 18-hole golf course that meets international standards is also part of the project. Neighbouring the golf course there is a village with a hundred piece of 450-550 m2 separated building site with an own lake suitable for bathing. The thermal recreational lake will gain water from the Hévíz Lake, which makes it suitable for bathing from April to October. Around the lake a sandy-pebble beach is also planned. As for accomodation a hotel with 250 rooms and a separated, but functionally connected 100 units apartment hotel is planned. The 20.000 m2 real estate is located at the highest point of Hévíz. The existing castle style building was built in the 1920’s and has been used as a 3-star hotel with 30 rooms on 5 stores until the recent years. The building is in excellent condition, has its own medical water supply system and thermal well-spring which is potentially sufficient for a higher number of rooms and guests. The aim of the project is to make use of the large empty space behind the castle, where a modern 5-star Medical – Wellness – Spa hotel shall be built. In addition, the castle building shall be renewed and modernized and 15 quality suits shall be built instead of the 30 rooms. The development plans for this 200 – 250 room’s hotel complex are ready and principally accepted by the planning committee. There is three bulding on the property, the hotel, the kitchen / restaurant and a smaller building which was originally a private property, but it was merged into the Hotel’s in 2007. The Hotel consists of two wings, wing „A” was built in 1928 and has 42 rooms and 2 apartments, wing „B” was completed in 1981 and has 55 rooms and 1 apartment. The two wings are connected via a floor on the ground level. From the 80’s wing „A” was maintained only on a necesessary level, however wing „B” was renovated completely in 2009. The hotel has its own well, which is interestingly the oldest privately owned well in the country. It provides 41-42 oC thermal water for two pools inside the hotel and one outdoors. However, the well is already operating at full capacity, leaving no option to widen services related to the medical water, though further addition of non-medical water pools is possible. The development plans set by the local authorities allow to build in up to 60% of the area of the property (this value is currently 21,6%), which means that there is plenty of room to expand. 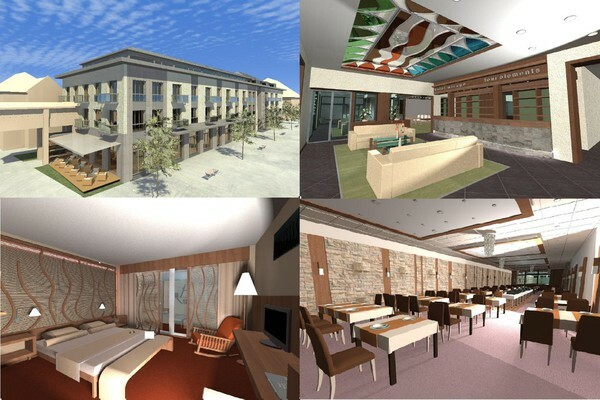 The project aims for a high quality 4-star medical and wellness hotel. Wing „A” shall be modernized, with the development of its existing medical capabilities. The kitchen / restaurant shall be merged into wing „A”. Regarding wing „B”, the rooms shall be modified to meet 4-star requirements. After its renovation, the smaller building could be used to host the hotel management. By the end of the project, the hotel would operate with approx. 291 rooms. The project aims to build a 5-star hotel with 265 units, where the luxury meets the medical benefits of the water of Hévíz Lake. The property is located only 800 m away from the lake, on the border of Keszthely and Hévíz. The project contains a 1.500 m2 medical facility as well, where rheumatological, internist, surgical treatments will be conducted. The project has the approval of all relevant authorities to begin the constructuion.